In 2001 I had an oportunity to return to the spot in Nepal that I had visited with my father as a 12 year old girl. 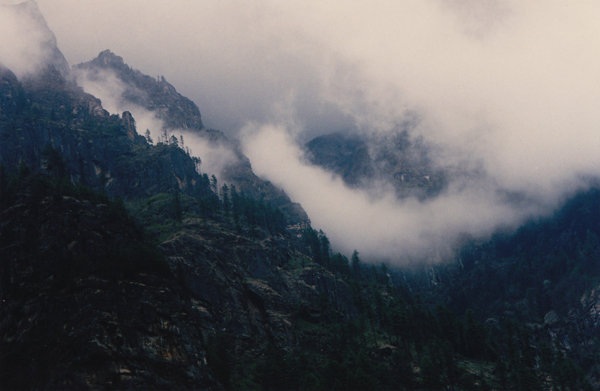 It was from a car window that I was first struck with awe by the clouds enveloping the mountains and hills. I envied the people on foot and vowed to return to trek around the Himalayas and immerse myself in that landscape at some point in my life. 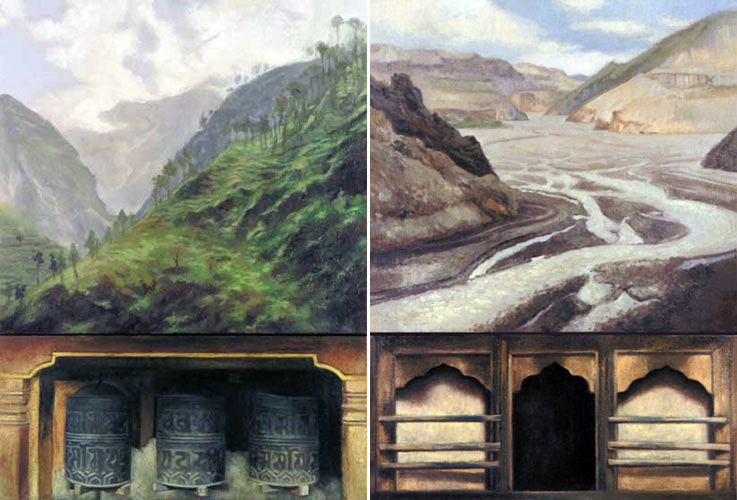 When I completed the 300km Annapurna circuit with Dan this year, trekking through the magnificent valleys and around the cloud enveloped peaks of the Annapurna Mountain range, I knew it would inspire me greatly but I didn’t realize it’s subtleties and would leave such a permanent mark on my work as a painter. 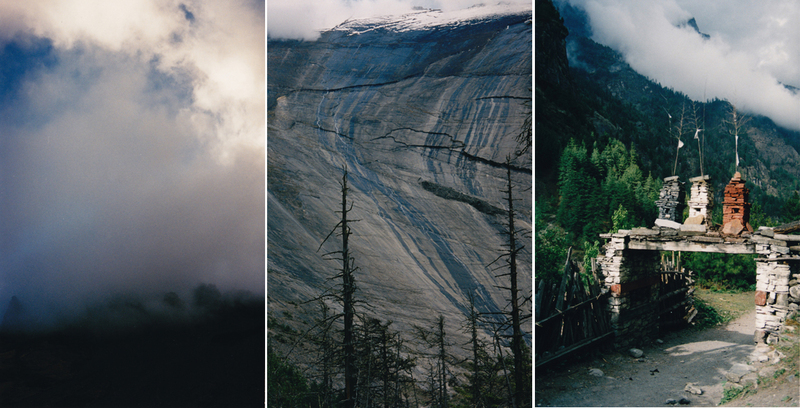 This trip inspired two bodies of work; a door series and a landscape cloud series which many is still evolving. In a few pieces I tried to marry the two in the form of a diptych. Starting in Beksisahar we hiked for 21 days through the extraordinary landscape, crossing villages and interacting with the Nepalese people all along the way. The orange colour dotted the green and blue/gray landscape. Perhaps the most challenging part of the trip was the climb up to the snow covered Thorong-La Pass. At altitude 5,416m (17,769 ft) above sea level in the Damodar Himal, it is the highest point on the trek and the highest pass in the world. Connecting the village of Manang (3540 m), with the temple of Mukhtinat (3800 m) and the village of Ranipauwa (3700 m), it is still regularly used by local traders. Starting out from Thorung Phedi (at 4420 m) it was a grueling 14 hour day dragging our feet up to the top and an easier descent in a snow flurry. When we go to the Buddist flag marking the top and the beginning of the descent I really felt like I was on top of the world. At the descent we were met by maize-like villages, as the circuit headed downhill to Jomsom along the restricted Mustang region, leaving clouds behind. The trek ended at the Phewa Lake in Pokhara, after which we spent a few days in Kathmandu exploring the various temples. I was particularly drawn to their carved doors which inspired an ongoing series of portal based paintings.